In Christian art Mary’s pregnancy was broached not only in scenes with Jesus as an unborn child but also in pictures of the virgin mother by herself or in association with the Eucharist. Depending on how realistic or symbolic the picture was meant to be, her pregnancy was made evident as a rounded belly, by showing the figure of a child, or by having “IHS” marked on Mary’s stomach. The original portrayal of this theme was the veneration with which, during her pregnancy, Elisabeth greeted Mary: “Blessed are you among women, and blessed is the fruit of your womb!” (Luke 1,42) This Bible text became widespread due to the “Ave Maria” (Hail Mary) which became part of the Advent liturgy in the 7th and 8th centuries and as of the 13th century had become one of the most important Christian prayers. In medieval times portrayals of Mary and Elisabeth meeting (the “Visitation”) became very common. From around the year 1300 the children were shown in front of their mothers’ bellies as can be seen in this painting from Kremsmünster (around 1460). The wings of the high altar of St. George’s Church (1462) 1462 were a complex altarpiece created by Friedrich Herlin for the Church of St. George, where he acted not only as painter of the panels, but also as an entrepreneur who co-ordinated the other artisans and carpenters. This Visitation detail show another common way unborn Jesus and John were recognized in Visitation paintings of this period. Light is emanating from the wombs of the two mothers. When the Angel appeared to Zachariah – he made a number of predictions about John the Baptist before his conception. One was “He shall be filled with the Holy Ghost even from his mother s womb” (Luke 1: 15) Here is what one writer says about the fulfillment of this Angelic pronouncement. 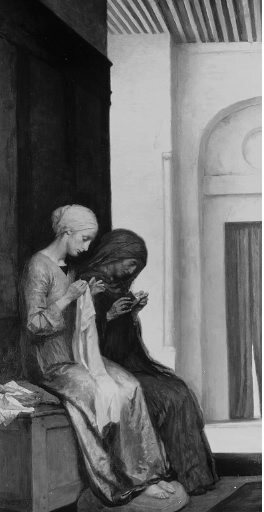 “Six months later, Elizabeth who had been waiting in solitude and silence for God to fulfil His designs, received a visit from the Mother of God, and the Precursor and the Messias Who was to come were brought into close contact. We cannot doubt that it was at that moment when, as Elizabeth said “the infant in my womb leaped for joy”, that John was “filled with the Holy Ghost”. Thus God cleansed His Precursor before his birth from the stain of original sin, again showing us that those who are to prepare for the Coming of His Son must be distinguished by their purity.” Mother St. Paul, Ortus Christi, p. 35. Soon after the Virgin Mary learned of her miraculous conception of Jesus, she visited her kinswoman Elizabeth, who was also expecting a child, John the Baptist. This representation of their joyous meeting comes from the Dominican convent of Katharinenthal, in the Lake Constance region of present-day Switzerland. Carved of walnut, with the original paint and gilding almost completely preserved, the figures of Mary and Elizabeth are each inset with crystal-covered cavities through which images of their infants may originally have been seen. 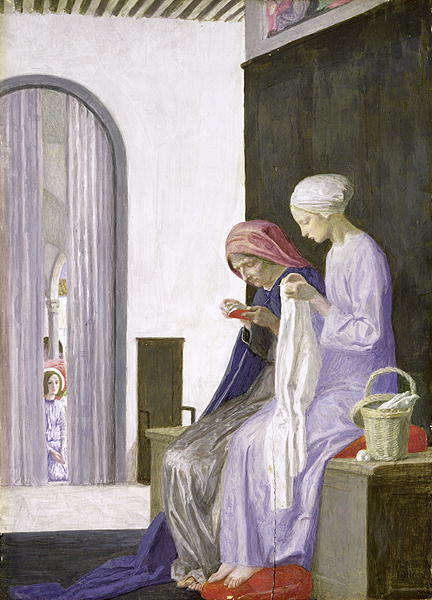 The representation of the Visitation incorporating images of the unborn Christ and John the Baptist, found with some frequency in contemporary works from German-speaking lands, emphasizes the moment when, according to “The Golden Legend,” Saint John, being unable “to manifest his joy with his tongue,” leapt “with joy in his mother’s womb.” The Virgin tenderly places her hand on Elizabeth’s shoulder, while her cousin raises her arm to her breast in reference to her declaration, “Who am I, that the mother of the Lord should visit me?” (Luke 1:43). Bishop Austin Vaughn (1927-2000), formerly Auxiliary Bishop of New York, who himself was arrested a number of times for prayerfully protesting in front of abortion facilities once wrote in an article entitled The Catholic Duty to Be Pro – Life: “It is not an accident, I think, that in the scriptures the first person, after Mary, who adored Jesus when He came into the world was St. John the Baptist….The second person who ever worshipped Jesus, after Mary, was an unborn baby, and I think God made it that way to tell us in our day and age the worth and importance of every individual right from the very beginning of life”. The wall paintings in the Chapel of St. Leonard are among the most important Romanesque frescoes discoveries that have been made in North Tyrol ever. Their rediscovery goes back to 1914. Although the paintings are not completely preserved, they are among the earliest frescoes of North Tyrol and thus are important in Austria’s art history. The latest research link these frescos to benchmark examples in South Tyrol and Graubünden and assume that the frescoes were created by 1210. “Truly He is in haste to be about His Father’s business. Truly He is an impatient conqueror, to be thus early beginning His conquests, and laying the foundations of His world wide empire. He can not bear to be in the world for even so short a while, but sin shall feel the weight of His unborn arm…..His first mission and ministry was in the womb, and the babe unborn the first conquest of His divine apostolate…..and the Unborn Child destroys the sin and abolishes the curse of the unborn child.” Frederick W. Faber, D.D., The Blessed Sacrament (Baltimore, MD: John Murphy Company, circa 1855), 162 163. The 3 wise men honored Unborn Jesus from afar by seeking Him and searching for Him, passionately and diligently, and by rejoicing in anticipation (Mt 2:1-10). Like the Magi, let us recognize that Christ came into the world as an unborn baby and a child. The Vatican Council in Gaudium et Spes points out “For by His incarnation the Son of God has united Himself in some fashion with every man”. We honor our unborn and child King when we teach respect for each unborn child and pregnant mother by our example. As they fell down and worshipped – we should approach these little ones and their mothers with awe and respect no matter where we find them. As they offered gold, frankincense, and myrrh to the Christ child, we should offer our love, support, and financial assistance as needed.